More than three years have passed since we evaluated Lowe’s first take on the affordable connected home. Lowe’s has expanded its reach into nearly every corner of the house since then, offering devices or partnering with other manufacturers to add support for everything from garage door openers to hot water heaters, from garden irrigation to pet monitoring. But don’t make the mistake of buying a bundle thinking you’re getting a complete system. While the new hub is backward compatible with all the older Iris products, the rest of the Iris 2.0 components are not compatible with the original hub. If you’re an existing Iris customer, however, you can can upgrade to the new hub at no charge. Lowe’s new hub is smaller and easier to hide than its predecessor. Lowe’s has also made significant changes to its service plans. Previously, the free Basic plan was so limited that it was largely useless (you couldn’t schedule devices such as smart light bulbs to turn on and off automatically, for instance). You can build out a reasonably smart home without having to pay for a subscription, but you’ll still need to pony up for the $10-per-month Premium plan to create custom groups of devices, to send alarm notifications to more than one person, or to create automation rules in which one device triggers another. Add a video camera, and you’ll need the paid plan to record video on demand or based on alert events. Unlike some service providers, however, Lowe’s paid service plan never goes above $10 per month, no matter how many components you add. One thing you can’t get from Lowe’s—at any price—is professional monitoring, where an alarm can notify someone at a call center to dispatch first responders to a break-in, fire, or medical emergency. Lowe’s has dumped its web-based management system in favor of one that’s based on its easy-to-use mobile app. You use the app for all setup, monitoring, and customization—you can add photos of your home, devices you intend to control, and family members living inside the home. Iris’ smart devices can be linked together: here the Smart Button is linked to the Smart Plug that turns on the lamp. Lowe’s new hub is a significant improvement over its predecessor. It’s much smaller, and it has two USB ports that can be used to add support for expansion possibilities. As with Samsung’s Smart Things system, the Iris hub must be hard-wired to your router for Internet connectivity. Since ZigBee and Z-Wave are both capable of forming mesh networks, where every node on the network is also a repeater, this shouldn’t present too much of a problem. Setting the system up wasn’t a flawless experience for me. The app warns that this process can take up to five minutes to complete, it took two tries to finally get it to connect. I also encountered an issue where the hub failed to re-establish its connection to the Internet after my broadband service failed and then returned.I received no notification from within the app, so my first realization that something was wrong came when I couldn’t figure out why the smart plug was no longer operational. Lowe’s offers 3G Internet backup in the form of a $50 USB dongle from Novatel, with Verizon service, which I did not review. As I mentioned earlier, the $50 hub is no longer included in the Iris bundles, of which there are now two: The $99 Security Pack includes two contact (door/window) sensors, one motion sensor, and a numeric keypad (for arming and disarming the system). 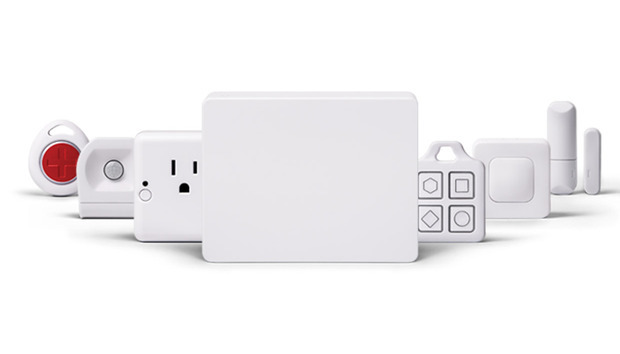 The $129 Automation Pack includes the same set of sensors plus a smart plug and a smart button in place of the keypad. You can program the new Iris smart keypad with a unique PIN code for each person in the family. While these bundles do provide significant discounts over buying the components a la carte, they provide only a taste of what the connected home can be. With the Security Pack, for instance, you’ll be able to monitor only two entry points (doors or windows) and one room. You can add more sensors, but it will cost you. And if you want a siren to sound off if an intruder breaks in, you’ll need to spend another $35 for a third-party siren. Want a light to turn on when the door opens, you’ll need either a smart bulb ($20), a plug-in module $35, or an in-wall switch ($35 to $45). But Lowe’s has wisely incorporated support for third-party hardware where it doesn’t offer private-label solutions. In addition to the aforementioned siren, you’ll find Iris-compatible entry locks and deadbolts from Kwikset and Schlage, smoke and carbon-monoxide detectors from First Alert, in-wall lighting controls from GE, thermostats from GoControl and Honeywell, garage-door openers from Genie, and much more. There’s even a water-leak sensor with an integrated motorized shut-off valve. You’ll find everything, including prices, on Lowe’s Iris website. Lowe’s sent a large collection of its Iris 2.0 components, so I was able to get a thorough look at the new system (it did not send either of its new security cameras, though). Using the app, it almost always took less than five seconds to pair each device with the hub. The mobile app is the best part of the Iris platform. It’s well designed and simple to use—at least until it comes to defining automation rules, such as automatically turning on a lamp when the front door opens at night. Lowe’s did the best they could given the limited display real estate on a smartphone, but I found myself craving a web-based app that I could use on a desktop PC. You can upload a photo of each of your devices to the Iris app for visual confirmation. When Lowe’s announced Iris 2.0, it touted a maintenance feature that would set its service apart from the competition. It would be able to monitor compatible appliances and automatically respond to fault codes, offering to send you a replacement part if you wanted to effect a DIY repair, an appointment with a service technician if you wanted professional repair, or a discount off a new appliance if it’s too old to be repaired. The service will also suggest maintenance tasks to help homeowners stay on top of things. But those aspects of Iris 2.0 are not yet available. The new Iris hub is faster and more flexible in terms of protocol support, and the Iris 2.0 components are smaller and more attractive. Lowe’s has a better retail strategy in terms of its bundles than it did when it first entered the market, too. But the most attractive element of today’s Iris system is the diversity of compatible products. If you’re already an Iris customer, by all means, upgrade to Iris 2.0. The new hub is free to you, and you’ll be able to take all your first-generation Iris products with you. Your decision is more complicated if you’re looking to start fresh. Staying in the DIY vein, there are systems like Samsung’s SmartThings to consider, as well as services that do offer professional monitoring, such as FrontPoint Security. And if you’re not the DIY type, you might want to look at ADT, Vivint, or one of the host of other full-service providers; just know that they’ll cost more and require you to sign a contract. Iris 2.0 is a very good system with a very good ecosystem now, and it could become a whole lot better if Lowe’s delivers on its maintenance and repair promises. While it’s not a good idea to buy any product based on features it might offer one day, Lowe’s offers enough today to make Iris a solid buy.